I'd been wanting to check out the new Lush store on Oxford Street since I heard of its opening. Apparently it's the largest Lush store in the world but what really sold it to me was the promise of all new products that were exclusive to this store. With three floors and each hosting a separate category of items (shampoos, shower gels, face masks and scrubs on the ground floor, spa, massage products and perfumes in the basement), I headed straight upstairs to the bath section and picked out one of each of the new bath bombs to try (and also one bubble bar because I just couldn't resist). Here's everything I purchased as well as what I thought of the ones I've already tried. Ground control to major bomb. Prepare for takeoff as this awesome mix of peppermint and popping candy explodes in your bath, creating the scent of an intergalactic 80s rogue. Launch it into the water to become the guardian of your own galaxy. I just used this one the other day and it's by far my favourite Lush bath bomb I've tried. The lady working there said it was inspired by the film Guardians of the Galaxy. 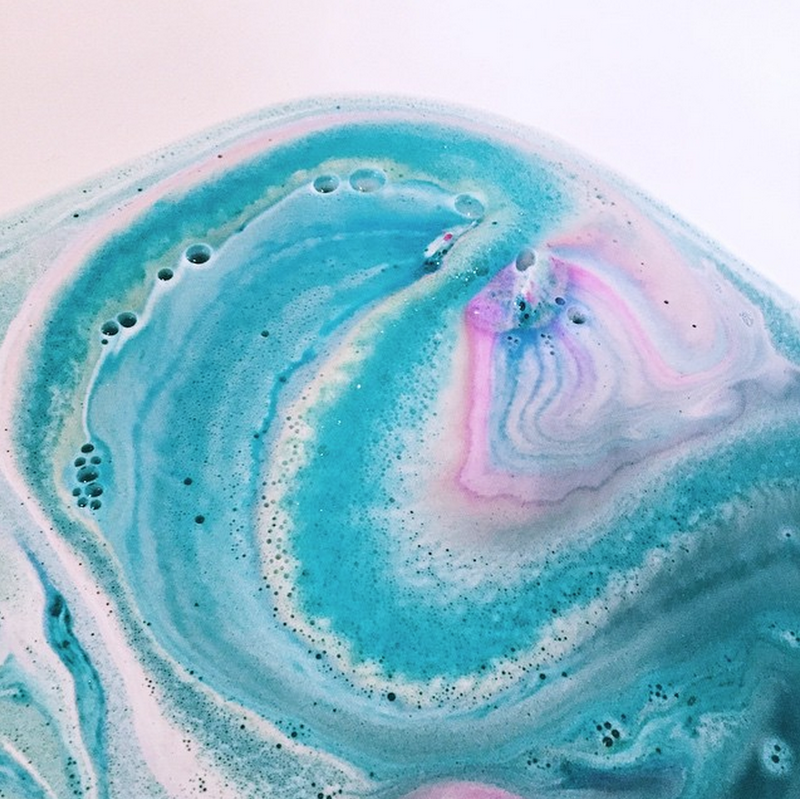 It smells minty fresh and after the initial burst of blue, the bomb fizzes away and leaves the top layer of your bath in a mesmerising rainbow of colours. The water is infused by tiny particles of glitter that really does make it resemble a galaxy but the best thing is it all washes off (I've previously had a terrible experience with Lush glitter sticking for weeks). I'll be repurchasing this one for sure. Your odyssey awauts. Drift away on exotic waters to a land of mood-brightening Tunisian neroli and exotic jasmine fragrance. I just can't seem to shake the image of a hard boiled egg with this one, haha. It smells like it would be quite a relaxing one though so I'm looking forward to popping it in the bath after a long day. If you long for calm and contemplation, drop this layered bomb into the bath. As the mesmerising colours unfurl, woody olibanum and ho wood create an atmosphere of deep relaxation. I've used this one too. It smells warm, spicy, and comforting and leaves the bath water primarily orange until it releases more colours at the end and turns the mixture more of a brown shade (hmmm). It's nothing too exciting but I really love the scent of this one. 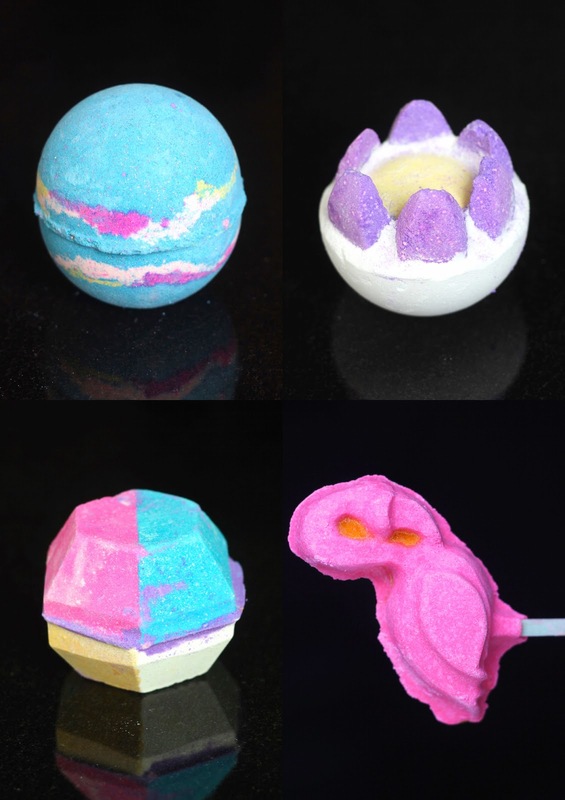 Do you want to have a bath bomb? Do you want to splash and play? Take this magical blend of uplifting grapefruit and Tunisian neroli into the bath with you to thaw the iciest of moods. Another one I've tried. This one has a fresh, clean scent and turns the water a vibrant shade of blue. Made me feel more of a mermaid than an ice princess though. For some reason I really enjoy bathing in blue water (as opposed to any other Lush bath bomb colours) and one of their original bath bombs that was a similar shade to this was Big Blue except I couldn't stand the feeling of the seaweed that's released with that one, so this one is a good alternative. Birds of a feather bathe together! Slip into something more fruity with this cocktail inspired reusable bubble bar, filled with fragrant rosewood and ylang ylang. Let the bubbly flow. I was already at the checkout when I smelled this one at their counter and had to make it a last minute addition. It smells absolutely divine, super sweet and very strong, I can imagine it lingering on your skin for hours after your bath. A sleeping potion on your bath, the calming essential oils will calm restless minds and send you on your way to a heavenly sleep. This one smells quite spicy as well, though I'm rather put off by all the glitter coating it. I hope it washes off as easily as the Intergalactic bath bomb. Go from 0 to 60s when you bathe with this bomb. Bobbing orbs - made with 100% traceable cocoa butter - and a triple whammy of orange oils are guaranteed to make you feel groovy, baby. This reminds me of those spinning, multicoloured, disco ball lamps that we had as a kid, you know the ones I mean? It's super neon though and I'm really digging the orange and navy colour combo, I kind of wanna plan an outfit in this colour scheme now. It smells strongly of oranges (surprise). When this grounding, mossy bomb hits the water your bath will be transformed into a mystical oakmoss and cypress forest lagoon, packed full of rosewood oil from our Peruvian rainforest concession. This one smells like freshly cut grass, super refreshing. I can't help sighing every time I sniff it. Also 'mystical oakmoss and cypress forest lagoon' sounds so magical, I harbour a huge love of forests. Caution! Drop this into the bath if you're prepared to detonate scents of intoxicating Majorcan almonds and rosewood from our Peruvian forest concession. Watch as a volatile slick of mercury silver breaks loose. Well what do we have here? A bath bomb that isn't spherical in shape? The official description sounds quite exciting I must admit, I can't wait to use this one. On first sniff, it doesn't smell very almond-y though. I think this one wins in terms of most unique looking Lush bath bomb. It looks like a crystal or a molecule and with no description at all, it will be experimental indeed. The scent packs a punch already though I can't pinpoint what it is. Excited to try this out and I'll be sure to update you all. For the time being all these products are only available from the Lush Oxford Street store but hopefully they'll be stocked at other outlets and online in the near future. Have you paid a visit? What did you think of the store and what did you purchase? These look so amazing! I'm so jealous. Is it bad that I want to go to London just to visit the store? Sigh. I love your photos! They look SO amazing in the bath. It's like a unicorn bath. I need a bath! x A.
I really like how you've taken the photos, they stand out well on the black background. They look lovely. I've just done a Lush Unboxing over on my blog too.